The enticing fragrance of fresh yeasty bread beckoned us into Jen Ownbey’s converted-garage bakeshop in Olympia, Washington. A huge variety of loaves graced her shelves: yeast breads, regular and gluten-free; quick breads with mixtures of grains; sweet treats. While we chatted, she whipped up a batch of quick bread made with locally-grown zucchini — without using a recipe! 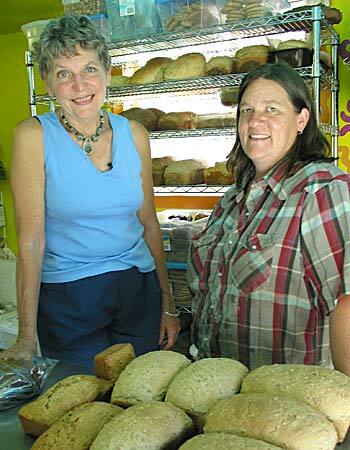 As she deftly cracked eggs together and poured them into the mix, Jen said that shareholders in her Eight Arms Bakery CSA (Community Supported Agriculture) get a yeast and quick bread each week plus baked sweet treats. She also brings her fresh baked goods to the local growers markets and natural foods stores. Watch Your Personal Baker – A Bakery CSA (episode 188).